"Once there was a Hushpuppy, and she lived with her daddy in the Bathtub"
Beasts of the Southern Wild is best approached as a fairy tale, albeit one deeply rooted in contemporary social contexts. As a fantastical fable, the film often radiates with vivid, emotive energy, and occasionally allows you to forget the fact that you're watching what is often an amalgamation of familiar ideas and influences. Quvenzhané Wallis (six years old at the time of filming) plays Hushpuppy, a young girl living on a fictional rural American isle known as The Bathtub. It's separated from the mainland and wider society by a giant levee. Hushpuppy lives in a woodland shelter alongside her father Wink (Dwight Henry). He's far from the ideal guardian due to his alcoholism, aggression and frequent need to be hospitalised (before he inevitably escapes again). Basically forced to fend for herself, Hushpuppy attends a local ramshackle school and feeds herself - even killing her pets for meat if she has to. As the polar ice caps melt, The Bathtub is under the grave threat of flood, and after a particularly nasty storm, only a small group of survivors remain. Hushpuppy, Wink and the other residents are determined to remain at home, despite the triple threat of the authorities, illness and a group of prehistoric aurochs who are marching their way towards the community. The film opens strongly with a terrific pre-title party sequence. It's a scene of pure, infectious joy as the Bathtubbers celebrate their annual holiday. It's a thrilling introduction to the setting, but also to the superb soundtrack (composed by director Benh Zeitlin himself in collaboration with Dan Romer) which might be the best of the year. Sight & Sound - in a scathing and condescending review - critiques the film and score as the cinematic equivalent of an Arcade Fire / Neutral Milk Hotel song: well, as a fan of those two bands' rousing compositions, dare I suggest that is actually a good thing? At its best, the film is a dreamy, charming and emotional creation that would soften even the hardiest of cynics' stone hearts. Alas, said cynics will find and have found ammunition elsewhere. The film wears its influences proudly - too proudly, possibly. Most obvious is Mr. Terence Malick, who has very much inspired both the cinematography and Hushpuppy's voiceover (which, admittedly, is the rare exemplary implementation of that cheap cinematic shortcut - lines such as "I will go to your grave and eat﻿ birthday cake all by myself" are gems). Elsewhere, plenty of similarities can be drawn with works as diverse as George Washington, Ponyo on the Cliff by the Sea and Where the Wild Things Are. Deep down, the film isn't much more than a familiar coming-of-age story and bittersweet father-daughter reconciliation story - universal themes for better or worse. 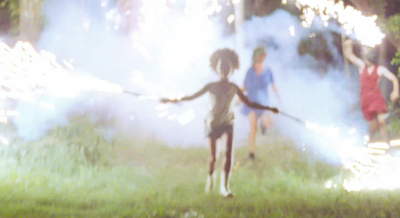 If Beasts of the Southern Wild has one major problem, it's that you've seen a lot of it before. Luckily, the surreal tone and distinctive presentation ensures that it also has an identity of its own. The peculiar mix of naturalistic delivery and straight-up fantasy is confidently handled - most notably the majestic ancient creatures who appear every so often, memorably realised with a mix of practical and computer effects. Zeitlin and his collaborators ensure this potentially contradictory mix of styles works well. Also giving the film a unique edge is its affection for New Orleans and Hurricane Katrina victims. The Bathtubbers are a proud bunch, rejecting unwanted interference and determined to build a liveable society for themselves. Mostly, this is an uplifting ode to the passion and resilience of disaster victims, and an effective way of crafting a fable about very sensitive issues. Of course, there is a side effect that the characters are sometimes stubborn to a fault, and others will dismiss it as liberal wish fulfillment and revisionism - actually, The Daily Mail already and reliably have that angle covered. Oh: Wallis and the filmmakers do a stellar job in making Hushpuppy an engaging protagonist - a child forced to actively deal with situations well outside her maturity range. Critics and audiences are always quick to unleash hyperbolic praise on child performances, but Wallis is a truly impressive discovery. As I've already argued, there are frequent moments when Beasts of the Southern Wild's rough edges are almost entirely forgotten. There are scenes of real tenderness, raw emotion and giddy cinematic enthusiasm. The score bursts to life, and the screen is full of energy and vivid colour. Overall, it's dark and sombering when it needs to be, and hyperactive as required - a celebration of life, and a thoughtful meditation on death. There's not a hell of a lot going on at times, and it is too familiar to be classed as a true original. Yet this modern day fairy tale regularly casts a genuinely bewitching spell.